In order for your lead ad to convert, it has to resonate with your target audience. But how do you know who you should target? The most effective way to target the right people is to create a lookalike audience from users who have already demonstrated an interest in your product or services. When you do this, your lookalike audience will share qualities like age, profession, gender, or interests with user who have already developed a relationship with your brand. Facebook can easily help you find and target your lookalike audience if you follow the detailed instructions here. If you have installed the Facebook Pixel, you can also target an audience that has visited your website, or part of it. 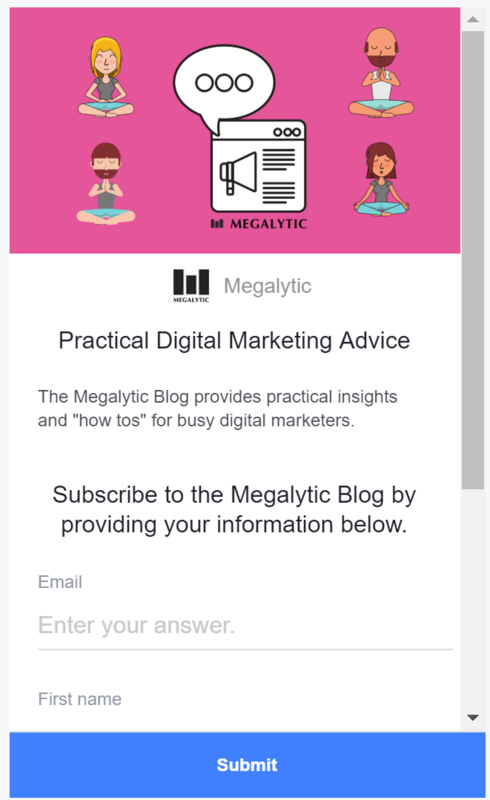 For example, here is an audience we created for a Facebook Lead Ad designed to sign up Megalytic Blog subscribers. If you don't want to use a lookalike audience, the next best thing is to define an audience where you are as granular as possible. Look at job titles, education, relationships, hobbies, income, entertainment interests, and anything else that might help define your target. Once you’ve determined your audience, your creative, which includes the visuals and copy used in your ad, has to resonate with them. Choose a striking image your audience can relate to and that supports your message. As you write your copy, think about what kind of information your audience needs and what kind of language will most appeal to them. Never reuse copy from old campaigns by simply cutting and pasting. Instead, focus your copy around the benefits of the product or service you’re offering. Here is a good example of a Facebook lead ad with outstanding creative. It's from Adobe, advertising their Stock Photo service. The creative is good because it shows off the product (photos). It is an arresting image that will capture peoples attention. And lastly, they use their logo to brand the ad. You can do the same with a stock photo by darkening the image an putting your logo on top. That way, in addition to running an ad, you are gaining exposure for your logo. 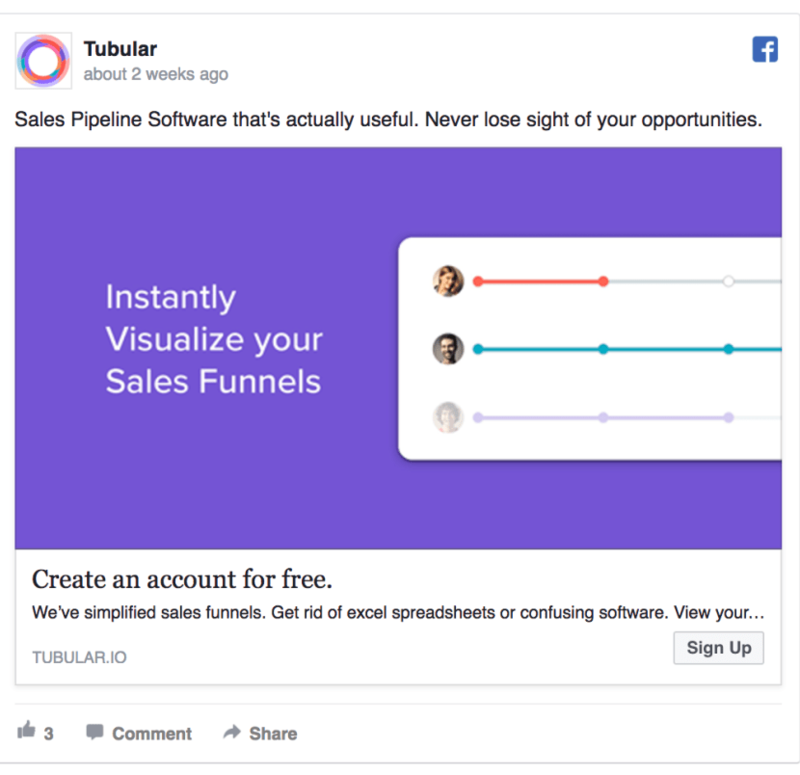 In order to convert, your Facebook Lead Ad needs a strong and clear call to action that tells the viewer three things: what they need to do, how to do it, and what they can expect (the benefit). Clarity of benefit is essential because some people aren’t familiar with how Facebook lead ads work. They might be reluctant to click a button and fill out a form, unless they are very motivated by the benefit. So you need to emphasize the benefit and value they’ll receive from filling out the form. You can also improve performance by providing clear text that works with the CTA button. For example, in this ad by Tubular, the text "Create an account for free" works well with the "Signup" CTA button. For many people, an incentive is key to clicking on an ad. If you can incentivize their click, you’ll often see increased conversions. Before you offer an amazing incentive, however, think about where your audience falls in the sales funnel. If they’re at the bottom, a discount or coupon is in order. If they’re at the top or middle, free and valuable content or a subscription to a service would be more appropriate. If you’re selling something, offering a coupon in exchange for their email is a good way to grab new leads. This incentive also gives them good reason to make a purchase. Incentives only work if you can clearly state the benefits of clicking or signing up. Make sure to emphasize that people must sign up in order to get the incentive. 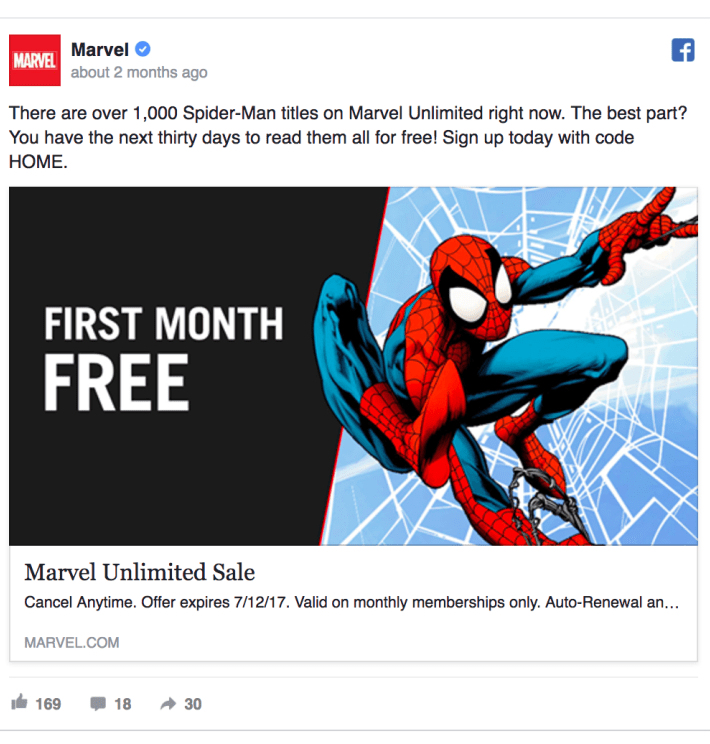 As shown in the Marvel example below, "First Month Free" is always a great subscription incentive, particularly if you can combine it with an instantly recognizable image like Spider-Man. 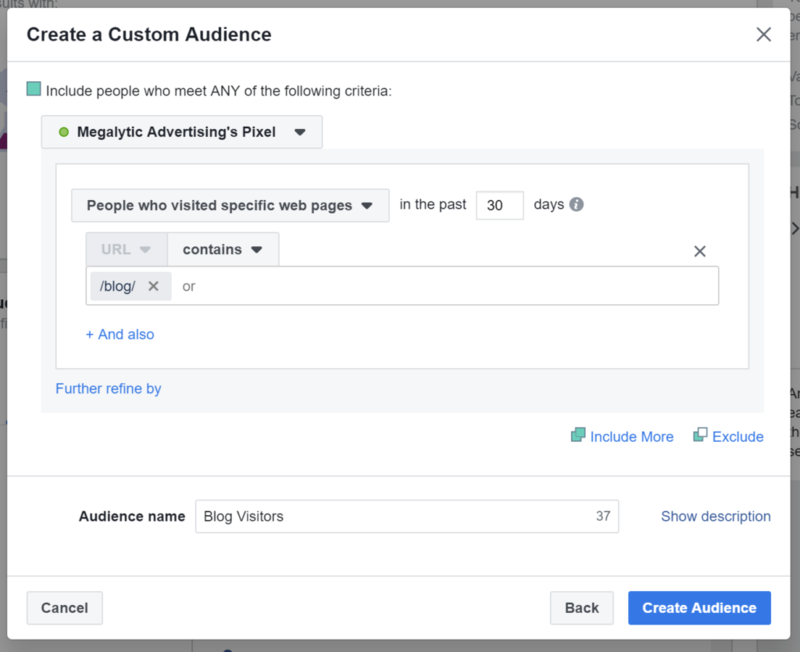 Facebook Lead Ads allow you to create an optional Intro section on your lead form where you can provide more detail about your product or service. When you want more qualified leads, this can be useful because it allows you put additional information in front of the user before they sign up. The additional information helps screen out people who are a bad fit for your business. It can discourage impulsive form completions from prospects who don't really understand what you are offering. Below is an example Intro section from a form used in a Megalytic Blog subscription campaign. It is designed to make it clear that the user is subscribing to a blog about Digital Marketing. If your audience isn't online, they cannot engage with your lead ads. Think hard about when your audience is most likely to be active on Facebook or Instagram and schedule your ad accordingly. You can always adjust your schedule. If you look at your data and see that certain times of day are better for conversions, you might consider constraining the hours that your ad runs to be limited to those high conversion times. And be sure to turn off your ads during times when your audience isn’t active. This will save you money. To learn how to use the scheduling system, read the Facebook document here. While the Facebook feed is important, for your ad to reach its full potential, it must also be Instagram friendly. The best Instagram lead ads are image-focused and incredibly succinct. 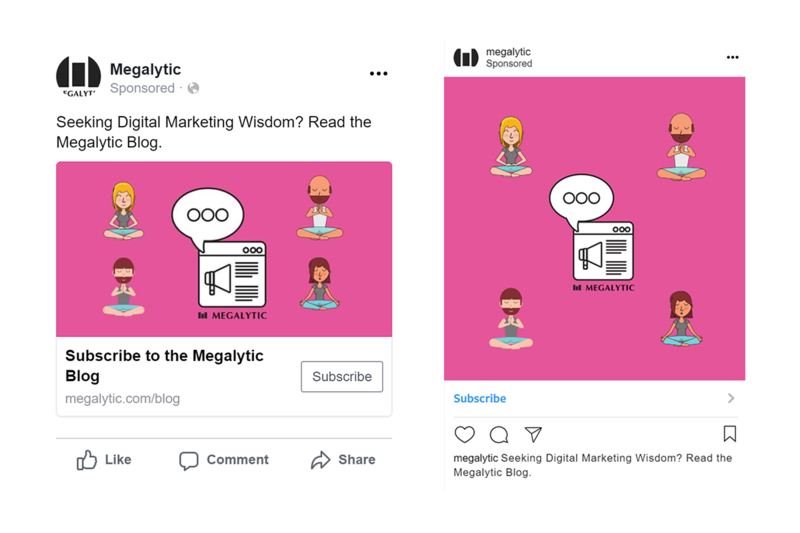 Ideally, you should have two versions of the image used for your lead ad: one optimized for Facebook and one for Instagram. 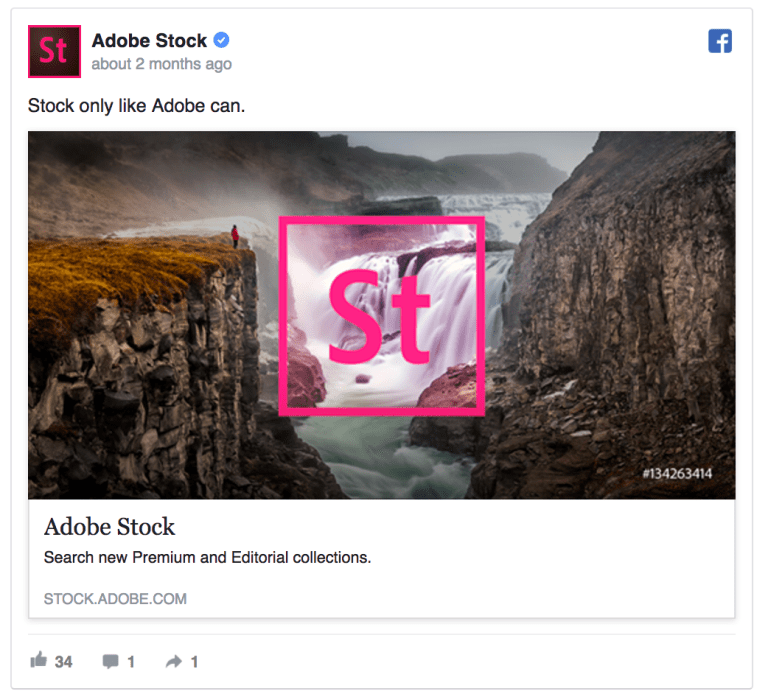 Start by creating a strong Facebook ad. Then edit the image to optimize it for the Instagram feed. Instagram images are typically more square than on Facebook. For example, below is a side-by-side comparison of the Facebook and Instagram versions of a Megalytic Blog subscription lead ad. These are both mobile ads, but you can see that the Instagram version is noticably more square. By creating two different ads with the ideal dimensions for each platform, you’ll enjoy a higher conversion rate. Your last step is to make sure you follow up with anyone who signs up through your lead ad. At this point, it’s crucial to contact your lead quickly as leads that are contacted early are much more likely to develop a close affinity for your brand. For example, if your ad offers a free eBook download, follow up soon after to find out of the user might become a qualified sales lead for your product or service. In your ad, make sure it’s clear when and how you’ll contact the lead, and then make sure you do it relatively soon, especially if you’re offering a free quote or consultation. In a nutshell, there are many things you can do to increase the likelihood that your Facebook lead ad will convert. From stellar creative that targets the right audience to a strong CTA, to timely follow up, by taking a few simple steps you’ll see your conversion rates soar.